©2019 The Topps Company, Inc. Description: In the right place, a few small rocks can change the course of a river. The Seekers of Clan Goliath Scorpion and the Escorpion Imperio have long sought out relics of the past which they believe will steer their course. But relics are not the only rocks: one small unit and its warriors changed the path of the Clan and the Imperio. The saKhan of fifty years who formed them. The Star Colonel who returned to guide them in their darkest hour. The survivors who escaped the Reavings to claim a new home. Those who continue to use the relics of the past to guide the future. Come discover the small rocks of the Crimson Seeker Star, who changed the course of the Seekers, the Goliath Scorpions, the Escorpion Imperio and many more. 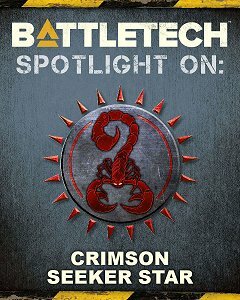 Spotlight On: Crimson Seeker Star includes a Unit History, Personalities, Personnel Rosters, Mission Tracks, and data for use with all scales of BattleTech play.